This article explains how to connect your LinkedIn and Microsoft accounts, where you can see LinkedIn information in Microsoft apps and services, and what kind of LinkedIn information may show in Microsoft apps and services. Note: You can connect your accounts and see LinkedIn information only if you or your organization have received an update that includes LinkedIn features, or if you've joined the Office Insider program. Some LinkedIn features are being introduced gradually, so the LinkedIn features you see may differ slightly from what is described in this article. 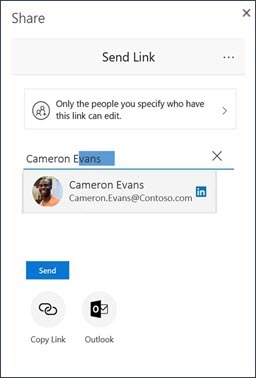 Even before you connect your accounts, you may see some LinkedIn profile information such as a person’s LinkedIn profile photo, name, company, and job title in your Microsoft apps and services. After you connect accounts, you may see additional LinkedIn profile information. For example, you can see things you have in common with others, such as that you attended the same school. When communicating with a colleague in Outlook, you can easily see if you and your colleague share a common connection on LinkedIn. Your LinkedIn contacts may also show up as suggested contacts in Outlook on the web and OneDrive for Business. Over time, you can also expect your networking experience on LinkedIn to improve with information from your Microsoft account. For example, LinkedIn may suggest that you connect to some of your Microsoft contacts. Important: We respect your privacy and will honor your public profile visibility settings on LinkedIn. Go to a Microsoft app or solution, for example Outlook on the web. Select your own or someone else's profile picture or name to open the profile card. Select Yes, let's go / Continue to LinkedIn. Select Accept to connect your LinkedIn account with Microsoft. Select Accept to connect your Microsoft account with LinkedIn. Select Got it! to complete the connection. When you connect your LinkedIn account to your Microsoft work or school account, you allow LinkedIn to provide profile, interests, subscriptions, and connections data to Microsoft. Calendar data - includes meetings in your calendars, their times, locations, and attendees' contact information. Information about the meeting, like agenda, content, or meeting title is not included in the calendar data. Subscriptions data - includes subscriptions provided by your organization to Microsoft apps and services, like Office 365. Contacts data - includes contact lists in Outlook, Skype, and other Microsoft account services, including the contact information for people you frequently communicate or collaborate with. Contacts will be periodically imported, stored, and used by LinkedIn, for example to suggest connections, help organize contacts, and show updates about contacts. Contacts that have been imported to LinkedIn from your Microsoft account will be stored and persist on LinkedIn until you remove them. Learn more about what type of data is included after connecting LinkedIn and your Microsoft work or school account. Go to a Microsoft app or solution, for example Outlook.com. Select Accept. Your accounts are now connected. When you connect your LinkedIn account to your Microsoft personal account, you allow LinkedIn to provide profile, interests, subscription, and connections data to Microsoft. You also allow Microsoft to provide profile, calendar, interests, subscriptions, and contacts data to LinkedIn. Contacts that have been imported to LinkedIn from your Microsoft account will be stored and persist on LinkedIn until you remove them. Learn more about what type of data is included when using LinkedIn with your Microsoft personal account. To disconnect accounts and remove data sharing permissions, see Disconnecting Your LinkedIn and Microsoft Accounts. How is your data accessed and used? When you connect your accounts and share data between Microsoft and LinkedIn, in most cases, your data will be shared through application programming interfaces (API) access and will not be subject to long-term storage by LinkedIn. Contacts that have been imported to LinkedIn from either your Microsoft personal or Microsoft work or school account will stay on LinkedIn until you remove them. Learn more about managing your imported contacts on LinkedIn. Learn more about LinkedIn services, data transfer, and storage. Learn more about viewing data in the LinkedIn Privacy FAQs. When you connect your accounts, you’ll have easy access to many of your 1st-degree LinkedIn connections in Outlook on the web. For example, you can send email messages to LinkedIn connections without visiting their profile or looking up their email address. Important: This feature is only available in the new Outlook on the web. It is not available in classic Outlook on the web. If the toggle says "Try the new Outlook", select the toggle to turn it on. Create a new message and start typing a name in the "To" field. If you have any LinkedIn connections that match the name you typed, they may display in the list of suggestions. You’ll see the LinkedIn logo next to suggested LinkedIn contacts. LinkedIn connections that have chosen to hide their email address from their LinkedIn network will not show up as suggested LinkedIn contacts. When you connect your accounts, you can share files and folders with many of your LinkedIn 1st-degree connections using OneDrive for Business without knowing their email address. For example, when you enter a name in the Share dialog in OneDrive for Business, you may see a list of suggestions that match the name you've entered. If you have any LinkedIn connections that match what you've entered, they may display in the list of suggested people. You’ll see the LinkedIn logo next to the LinkedIn connections. For detailed steps on sharing files, see  Share OneDrive files and folders. LinkedIn connections that have chosen to hide their email address from their LinkedIn network will not show up as suggested contacts. If you don’t want your LinkedIn connections to show up as suggested contacts in Outlook on the web or OneDrive for Business, you must disconnect your accounts. Any LinkedIn connections you have emailed from Outlook on the web or shared documents with from OneDrive for Business before disconnection your accounts, may still show up as suggestions. It may take up to 24 hours for the changes to take effect. When I connect accounts, will my Microsoft email address be added to my LinkedIn account? Nothing changes with the email addressed that are associated with your LinkedIn account. Neither your work or school email, nor your personal Outlook email address will be added to your LinkedIn account when you connect accounts. Also, connecting accounts doesn’t change what happens when you send and receive messages on LinkedIn. I see LinkedIn information in Microsoft apps but I don’t see a person’s LinkedIn information. Why not? The person doesn’t have a LinkedIn profile. The person has changed their public LinkedIn profile setting. What happens when I have different profile information in my Microsoft and LinkedIn profiles? Your information on LinkedIn will not replace your information in Microsoft or the other way around. For example, let’s say that your title on your LinkedIn profile is “Senior Researcher”, and your title in your Microsoft profile is “Sr UX researcher”. In this case, your title on your LinkedIn profile will still be shown as “Senior Researcher”, and your title on your Microsoft profile will still be shown as “Sr UX researcher”. Can I connect my LinkedIn account to several Microsoft work or school accounts? Yes, as long as your Microsoft work or school accounts are with different organizations. For example, let’s say you work full time for Contoso and part time for Fabrikam. You can connect your LinkedIn account to both work accounts. I’ve connected my LinkedIn and Microsoft work accounts, but now I’m leaving my company. What should I do? We recommend that you disconnect your accounts when you leave your current work or school. Learn what happens to your data when you disconnect accounts . I don’t want to see LinkedIn information in my Microsoft apps or services. Can I turn it off? In Outlook 2016, Word 2016, PowerPoint 2016 or Excel 2016 select File > Options. In the General section, under LinkedIn Features, clear the check box Show LinkedIn features in my Office applications. Note: When you turn off LinkedIn information in one Office 2016 app, LinkedIn information will not be shown in any of the Office 2016 apps that you have on your local PC. You may have to restart your Office 2016 app to see the change. In Microsoft's web-based apps and services, such as Outlook.com or OneDrive for Business, LinkedIn information and features are fully integrated, so you can’t turn it off. However, you can control how others will see your LinkedIn information. Learn how you can adjust your LinkedIn public profile visibility. I want to see LinkedIn information for others in my Microsoft apps and services, but I don’t want others to see my LinkedIn information. Is this possible? Yes, you’re in control of your account, so you can select both if and how others will see your LinkedIn information. Learn how you can adjust your LinkedIn public profile settings. I’m an IT admin. Where can I find more information specifically for me? Data sharing between LinkedIn and Microsoft complies with the GDPR. For information about how Microsoft meets requirements of the GDPR, see Microsoft.com/GDPR and the Microsoft Privacy Statement. For information about how LinkedIn meets requirements of the GDPR, see LinkedIn and GDPR. You can request a copy of the personal data that LinkedIn stores by going to Account Settings on your LinkedIn profile. LinkedIn will provide the data in an easily readable format, including any data that has been imported from your Microsoft account, such as your contacts.